More than 70% of smokers indicate that they would like to quit. Smoking has many serious health effects including increasing your risk of death from heart disease and increasing your risk of stroke and cancer. One fairly new trend in the world of smoking is vaping or the use of e-cigarettes. Quitting is never easy so some smokers have turned to e-cigarettes as a safer alternative to cigarettes and potentially a way to ease the transition from smoking to not smoking. Is this really safe? 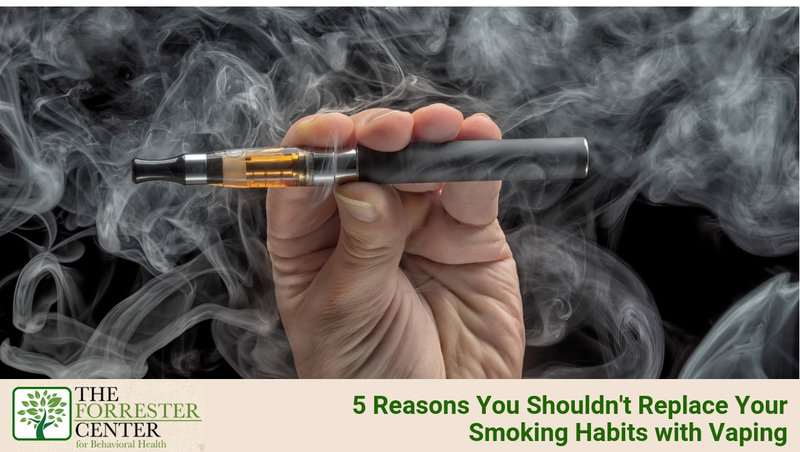 Here are 5 reasons you should not replace your smoking habit with vaping. E-cigarettes may contain less nicotine, but they still contain many chemicals that are potentially harmful to your health. The substances in e-cigarettes are currently being studied, but the long-term health effects are not yet known. If you choose to vape, you are ingesting many harmful chemicals that are not yet fully understood. There are still considerable amounts of nicotine in e-cigarettes and they are also highly addictive. Some e-cigarettes actually transmit MORE nicotine to your body than a cigarette especially if you purchase extra strength cartridges or you increase the voltage of your e-cigarette. The FDA has yet to determine whether e-cigarettes are an effective tool for smoking cessation. Some early studies show that those who try to quit using this method actually end up smoking both traditional cigarettes and e-cigarettes. E-cigarettes are often flavored in a way to make them seem healthier and less harmful than cigarettes. Young people, including teens have begun using them at alarmingly high rates. Read more about 5 Surprising Statistics about the Vaping Epidemic and Young People. Many think that e-cigarettes have less of a negative stigma than regular cigarettes so more and more people are trying them, increasing the number of Americans addicted to nicotine. Because e-cigarettes are not regulated by the FDA, there is little or no consistency across products, so you cannot be sure exactly how much nicotine and other chemicals you are ingesting. Vaping is not a proven smoking cessation method. If you are trying to quit smoking, consider reaching out to a healthcare provider and/or program that specializes in smoking cessation. The Forrester Center offers the “Freedom from Smoking” cessation program developed by the American Lung Association. This affordable program costs just $50 and is available to anyone over 18 years old. For more information about the Forrester Center’s smoking cessation program, call us today at 864-582-7588.